New Delhi/Mumbai: The prospect of Parliament passing the much-debated Lokpal Bill in its current form does not appear to be bright as political parties, particularly the Congress-led United Progressive Alliance (UPA) and the main opposition Bharatiya Janata Party (BJP), are unlikely to bridge their differences. 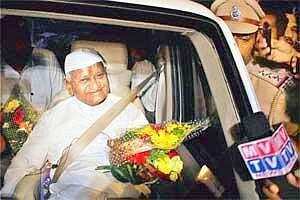 This comes at a time when social activist Anna Hazare is poised to step up his campaign on the Lokpal Bill. Hazare is to begin a three-day fast in Mumbai on Tuesday. Both the BJP and the Left parties are planning to move amendments to the proposed Bill, which currently doesn’t bring the Central Bureau of Investigation (CBI) and Group C employees under the purview of the Lokpal. Parliament is expected to discuss and vote on the Lokpal over the next three days. “The BJP will move amendments on issues we do not agree with. We are custodians of a strong and effective Lokpal. The Congress is not honest in its intentions and policies. It moves two steps ahead and four steps backward on the issue," party spokesperson Shahnawaz Hussain said. The BJP on Thursday had opposed the introduction of the Bill in its current form, questioning its constitutional validity. Similarly, Brinda Karat, politburo member of Communist Party of India (Marxist), or CPM, said that the government had introduced a “weak" Lokpal Bill that was framed in a manner that would help people involved in corruption rather than act as a deterrent. “We are bringing amendments based on our dissent notes in the standing committee. Our major concern is that there should be only one investigating agency that would probe all cases related to the Prevention of Corruption Act. The agency should be under the Lokpal," she said. “It is almost sure that the Bill in its present form is not going to be passed. The Congress is open to amendments and a section of the party at least is keen that something should be passed so that Hazare’s team will lose steam," said a senior Congress leader. Political analyst Subarata Mukherjee said the outcome of the session will depend largely on the Congress. “If the UPA is serious, then the opposition does not have the votes to obstruct it," he said. “It is a time of crisis and the Congress party must show its leadership." Mukherjee, also a former professor of political science at Delhi University, said “Hazare’s act is irresponsible because ultimately it is Parliament that is going to legislate. These kind of extra parliamentary actions have an optimum point and that it has already reached. Any other activity would lead to their decline of fortunes." Meanwhile, members of the Hazare team will launch a stir in his support in Delhi. Prashant Bhushan, a member of Hazare’s team, said that at least four issues were “non-negotiable". These include the Lokpal having its own investigative machinery, removal of the anti-corruption ombudsman not being under government control, inclusion of the lower bureaucracy and the investigation procedure. “The changes can be brought through amendments. These four issues are critical and on these issues amendment is needed," Bhushan told reporters after a meeting of Hazare’s team members in Delhi. In Mumbai, Hazare will conduct his fast at the Mumbai Metropolitan Regional Development Authority (MMRDA) ground at the Bandra-Kurla Complex business district. “The ground barely has a capacity of 60,000 persons and after receiving inputs from various sources, we estimate a crowd of not more than 25,000 to 30,000 people at the venue," said a senior official of the state intelligence department on condition of anonymity. The platform erected at the venue has a small room for Hazare, who is said to be suffering from viral fever. Liz Mathew of Mint andPTI contributed to the story.